A P&O worker has appeared in court charged with the manslaughter, due to gross negligence, of three sailors. The three men were on board the yacht, Ouzo, which left the Isle of Wight for Devon on 20 August, but disappeared. The bodies of Jason Downer, 35, from Kent, Rupert Saunders, 36, and James Meaby, 36, both from London, were found in the sea a few days later. Michael Hubble, 61, of Folkestone, Kent, was in charge of a ferry en-route to Spain at the time the Ouzo was lost. The agency worker, of Wine House Lane, Capel-le-Ferne, was officer of the watch on the P&O's Pride of Bilbao during a crossing on 20 August 2006. Explaining the allegations against Mr Hubble, Nick Hawkins, chief prosecutor, told the court: "These matters refer to the tragic deaths of three yachtsmen on board Ouzo, which came into close proximity with Pride of Bilbao. "At that time the defendant had sole responsibility of the ship." Ouzo had left Bembridge, on the Isle of Wight, bound for the Dartmouth Regatta. 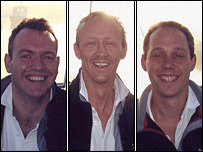 The bodies of the three-man crew were found on 22 and 23 August in the sea off the Isle of Wight. The cause of death for Mr Meaby was a combination of drowning and hypothermia, while the other two died of drowning. The 27ft (8.2m) Sailfish sloop has never been found. The car ferry and its black box data recorder was later examined to see if a collision had occurred. Mr Hubble was initially arrested on 2 September and released on police bail until Thursday, when he appeared before Portsmouth Magistrates' Court. 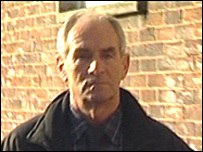 The case was adjourned to Winchester Crown Court on 16 February and Mr Hubble was released on bail without conditions.